All power to the councils! : A documentary history of the German revolution of 1918–1919 - An anthology collecting manifestos, speeches, articles, and letters from the German Revolution—Rosa Luxemburg, the Revolutionary Stewards, and Gustav Landauer amongst others—introduced and annotated by the editor. Failure of a revolution: Germany 1918-1919 - Sebastian Haffner Written in a gripping, journalistic style, Haffner's account brutally captures the bloody repression of the Revolution. 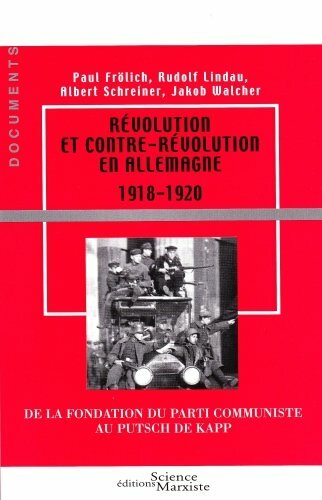 The communist left in Germany 1918-1921 - Gilles Dauvé and Denis Authier Dauve and Authier's history of the Revolution and the turbulent years following it, with an emphasis on the role played by left communists. The German revolution, 1917-1923 - Pierre Broue Extensive account of the revolution and the years afterwards. Written from a Trotskyist perspective. Working-class activity and councils - Germany 1918‑1923 - Peter Rachleff - A survey of the main events and the limits of working class activity during the Revolution. Spartakism to National Bolshevism - the KPD 1918-24 - Solidarity An account of the emergence of the KPD (the Communist Party of Germany) in the early days of the German Revolution - as a break from the Social Democratic Party - through its decline and transformation into a tool of the Russian Bolshevik regime. Anti-Bolshevist Communism in Germany - Paul Mattick - Council communist Paul Mattick's reflections on the German Revolution, which he participated in, and the communist currents that emerged from it in opposition to Bolshevism. Germany 1918-19 - International Communist Current A history of the Revolution with a focus on the different organizations involved. Origins of the Movement for Workers' Councils in Germany - Pamphlet on the origins of the movement for workers' councils in Germany, covering the 1918 revolution and its aftermath and activities and reactions of left and libertarian communists. Wild Socialism: Workers Councils in Revolutionary Berlin, 1918-21 - Wild Socialism examines the rise, development, and decline of revolutionary councils of industrial workers in Berlin at the end of the First World War. This popular movement spread throughout Germany, and was without precedent in either the theory or practice of the Social Democratic party and the trade unions allied to it. German Revolution 1918 photo gallery - Images from the German Revolution, including the Wilhelmshaven Revolt. Just added the Wild Socialism book. For those who don't know, Amazon lets you return ebooks, making it easy to download an ebook, copy it, and then immediately return it for a full refund. On copying legit ebooks, pretty sure ones bought from amazon et al contain metadata identifying the amazon user who purchased them. Anyone know of software to scrape off said metadata? The German Revolution 1918-1919 by Ralph Haswell Lutz (1922). A first-hand account by an America academic. Lots of excellent details, but rather dry and dispassionate. German Social Democracy 1905-1917: The Development of the Great Schism by Carl E. Schorske (1955). An interesting historical survey. The German Revolution of 1918: A Study of German Socialism in War and Revolt by A. J. Ryder (1967). This is a very thorough account. - Ernst Toller Masses Man/Masses of Man (1919), play, written by Toller in prison in a few days about the dangers of the revolution and the relationship between means and ends, the model for the main protagonist was Sarah Sonja Rabinowitz, a schoolteacher and USPD and Bund member who was one of the leaders of the January 1918 strikes in Munich, she committed suicide in prison in March 1918 after her husband, the famous linguist Eugen Lerch had announced in a newspaper article to divorce her for "patriotic reasons"
available in Italian and French but the German original wasn't reprinted since 1929: http://collectif-smolny.org/article.php3?id_article=1858 ... most of the authors were "Brandlerites"
Any chance you could remind us what a "Brandlerite" is, in your view (rather than Wikipedia's for e.g.)?. Just added Victor Serge's writings from his time in Germany in the aftermath of the revolution. Just added to the library The German Revolution by French Trot Pierre Broue. EDIT: I decided to add this to the key texts section. A fair amount of the book is taken up by descriptions of KPD internal wrangling, but it's the most extensive book on the revolution that I've been able to find in English. Well the West German film about Rosa Luxemburg covers the early days of the revolt at the end. Also the last episodes of the BBC drama Fall of Eagles is set during the events. Karen Hagemann, Stefanie Schuler-Springorum, Home/Front; the Military, War and Gender in Twentieth Century Germany. Claudie Weill, ‘Women in the German Revolution: Rosa Luxemburg and the Workers' Councils', in Christine Fauré (ed. ), Political and Historical Encyclopaedia of Women. Sean Dobson, Authority and Upheaval in Leipzig, 1910-1920: The Story of a Relationship . Robert Heynen, Degeneration and Revolution: Radical Cultural Politics and the Body in Weimar Germany.